While Bill Monroe and his mandolin may have created Bluegrass Music, it was undeniably, Earl Scruggs' Banjo that gave the music its most identifiable sound -- That Scruggs-Style 3-finger banjo picking. 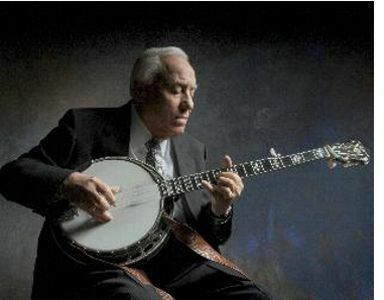 Monroe passed away September 9, 1996 and yesterday, we lost the master of the banjo, Earl Scruggs. It was as one of Monroe's Blue Grass Boys that Scruggs made his mark and, it never stopped. Scruggs was still performing up until the end of last year. Later performing with Lester Flatt as the Foggy Mountain Boys, more commonly known as Flatt & Scruggs, the duo solidified the sound of bluegrass music. Flatt & Scruggs redefined the music and for over 20 years. Best known to the general public for "The Ballad of Jed Clampett" for the television series The Beverly Hillbillies , for "The Story of Bonnie and Clyde", and the banjo picker's favorite, "Foggy Mountain Breakdown," Scruggs banjo playing was, thankfully so much more. There is no argument that Earl's banjo is the style that everybody in bluegrass music tries to emulate. There may be other influences but, they were all based on Earl's "Scruggs Style" and the multiple patterns of the 3-finger style rolls. If you listen to bluegrass music today, you're listening to the influence of this great man and his contribution to the music. Bluegrass music wouldn't sound like it does without Earl's Scruggs Style Picking in it. Scruggs popularity and ever presence on the Grand Ole Opry and in the media was due primarily to his wife, the late Louise Scruggs who died on February 2, 2006. Louise was his wife and business manager throughout his career. The two initially met on the Grand Ole Opry while Earl was performing with Bill Monroe and they were married two years later. Scruggs certainly didn't confine himself to bluegrass. With the Earl Scruggs Revue, he performed with his sons where they expanded their roles in music creating music far from the confines of traditional bluegrass. As a master of the instrument, he was able to take the banjo into new and exciting territory. With the Revue, he performed material from Bob Dylan, Shel Silverstein, Michael Nesmith, James Messina, and others. This he did comfortably and confidently as the Earl Scruggs Revue opened for rock bands and others well outside the realm of acoustic music. Music grew due to the influence and talent of this single man. Scruggs was a favorite at concerts, festivals, radio and television. Live or recorded, people honestly appreciated the wonder that was Earl Scruggs banjo. Earl Scruggs was honored with a National Heritage Fellowship, was inducted into the Country Music Hall of Fame along with Lester Flatt, was one of the first International Bluegrass Music Hall of Honor inductees and was awarded the National Medal of Arts. He was also a Country Music Hall of Fame recipient. He won a total of 4 Grammy® awards including the Special Merit and Lifetime Achievement Award at the 50th Annual Grammy® Awards. The Berklee College of Music honored him with an Honorary Doctorate in 2005. An untold number of other awards were bestowed upon him over the years. From his young days growing up in Shelby, North Carolina, he and his siblings and his parents all played musical instruments as this was common during that time and place. Beginning at the early age of four, he played fiddle and mostly a 2-finger style on the banjo. Most of his concentration was on the banjo, however. He was just ten years old when he developed a 3-finger style of picking. As he developed that technique, he was also creating a style that will endure forever. Earl has gone on to join Louise, Bill, Lester and others but, his legacy will be the style of banjo playing that is now performed around the world and in a variety of genres from old-time to jazz. His indelible mark on the music will last an eternity. The IBMA sends this update: Eddie Stubbs just gave us a call at the IBMA office and asked me to let you know that Earl Scruggs' funeral will be broadcast live on WSM-AM 650 and also at wsmonline.com on Sunday, April 1, at 2 p.m. Central Time. For those of you coming in person, the Ryman doors will open at 1 p.m.